Nicholas Mumby is the Principal Conductor and Director of Music for the Oxford Spezzati Soloists & Orchestra. He graduated with a degree in Classics in 2003 from Exeter College, Oxford, where he was also an Academical Clerk. He is a qualified lawyer and currently works as an associate solicitor in the commercial property department at Shearman & Sterling. Under his direction the Spezzati has grown in reputation, both in Oxford and abroad. In the summer of 2008 the Spezzati performed in the Lausanne Summer Music Festival during a six-day tour to the Swiss Riviera. They then opened the Sunningdale Concert Series 2008 at Holy Trinity Church, Sunningdale, at the beginning of September. Recent performances have focused on Baroque music, in particular that of Johann Sebastian Bach, including the Mass in B minor, St Matthew Passion, Christmas Oratorio and Magnificat. Other performances have included English music – by Finzi, Vaughan Williams and Warlock – and an acclaimed performance of Strauss’s Metamorphosen. He has studied conducting and organ under Dr Christopher Tinker, attended conducting classes with Dr Marios Papadopoulos, studied piano under Jonathan Darnborough and attended classes with Norma Fisher. In 2003 he was appointed as the first Conducting Apprentice at the Berkshire (USA) Choral Festival, held at Canterbury Cathedral. Nicholas was the Principal Conductor of the Oxford Millennium Orchestra from 2000 to 2005, conducting numerous concerts, and taking the orchestra from relative obscurity to its current respected position. During his tenure with OMO he conducted most of the major symphonic repertoire, and worked with many soloists including Jonathan Darnborough, Stuart Baran and Charlie Wilson. He also organised four highly successful summer concert tours to France, Switzerland, the Czech Republic and Germany. He currently holds the position of Conductor Emeritus. 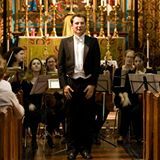 He has also held conducting positions with the Cantores Exonienses, the Keble College Orchestra, the Oxford Bach Choir and the Oxford Millennium Opera Company. He has conducted two fully staged operas, Purcell’s Dido and Æneas in 2000 and Mozart’s Così Fan Tutte in 2005. He has had an active involvement in sacred choral music, singing with all of the major Oxford choirs, and holding positions as Master of the Music at Pusey House, Assistant Director of Music at St Michael at the Northgate in Oxford and organ scholar at St Mary’s, Battersea. In 2008 he joined the Holst Singers under conductor Stephen Layton.